Initially it is important to gather as much information about the site as possible. This includes visiting the site, measuring existing structures (if any), natural features, and research of site dimensions, topography, zoning and other regulatory requirements. Develop conceptual plans integrating zoning, landcape, client program requirements, existing conditions and constraints. Study parking quantities and driveway access, building location and maximum floor areas. 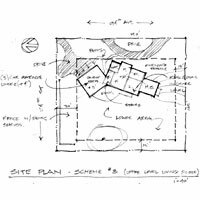 Develop floor plan options along with corresponding elevations that convey room arrangements and orientation on the site. Begin looking at exterior massing, style and materials. Shadows on elevation are used as a graphic method of creating a three dimensional appearance.